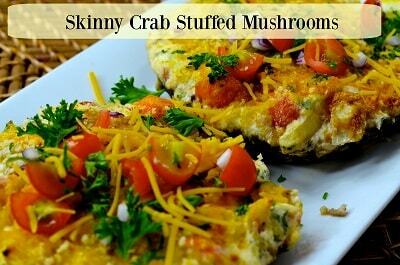 Combine crabmeat, light cream cheese, parsley, onion, Parmesan, mozzarella cheese, Creole seasoning, Panko breadcrumbs and Fiber One. Place mushrooms on baking sheet. Spoon mixture into mushrooms. Bake for 15-20 minutes. Remove from oven. Nutrition Facts per Serving: Calories: 140, Fat calories: 60, Total fat: 6 g, Saturated fat: 3.5 g, Cholesterol: 55mg, Sodium: 580 mg, Total carbohydrate: 11 g, Dietary fiber: 3 g, Sugar: 5 g, Protein: 12 g.
Recipe and photo is courtesy of Shelly Marie Redmond over at Skinny Louisiana - Louisiana Cooking and Living with a skinny twist! Used with permission.